I’ve missed talking to you all about my art and life in progress, but have been steadfastly determined to put all my effort into mission-critical work. Right now, that work is to finish my part of the Deluxe Tunnels & Trolls project. Backers privy to the Kickstarter updates have read about both our progress and pitfalls. 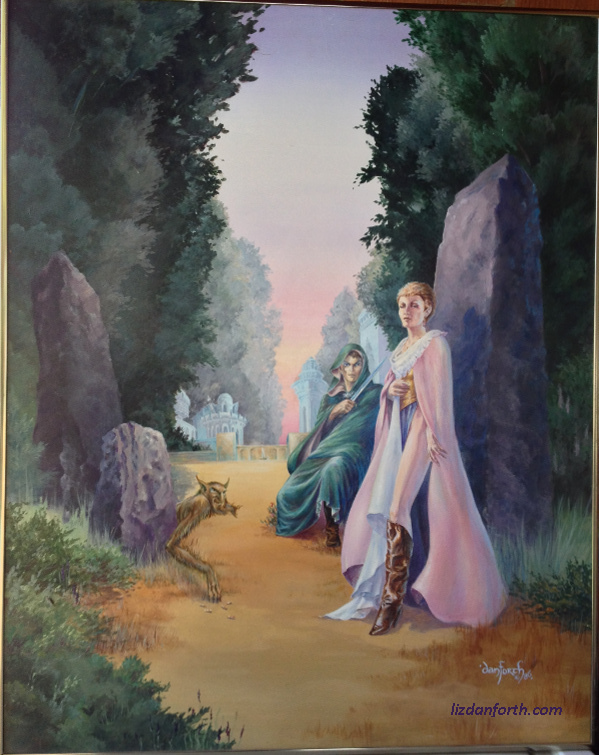 This post will be about the painting you might know as the cover to the T&T solitaire adventure called Elven Lords. 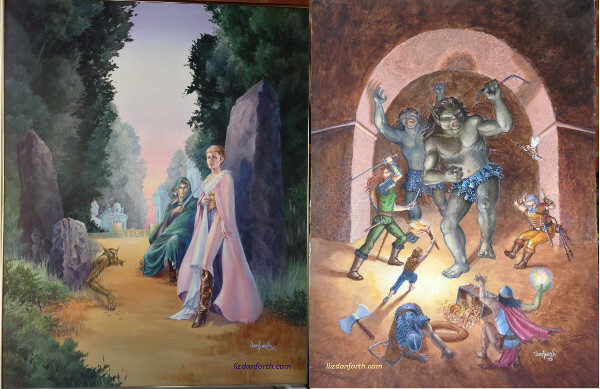 In the other post, I talk about the tale of the 7th edition cover of Tunnels & Trolls, a painting I call Two Seconds Later. Here’s a look at both. (Once both links are live, you can click this picture to go directly to the other post — and from there, you can click it to come here!) There will be larger versions of both paintings to look at more closely, so follow me over the jump. This painting was never intended to illustrate anything. As I have said elsewhere, I am mostly a self-taught artist… mostly, but not exclusively. I spent my whole youth aggressively avoiding art classes after my mother said my father was a better artist before he took classes than afterward. I even took up violin to join Orchestra, rather than be forced to take art class in middle school. (Band, Orchestra or Art — everyone had to do one of them. Sad how times have changed, isn’t it?!) I knew I enjoyed my artwork and didn’t want anyone messing with my style or my love for doing it. I have many reasons to question that choice today, but that was how it was at the time. Joan was nothing like that. In fact, it was several years before I ever saw her even give a demonstration in class. The only examples we had to go by were assignments other students had done so there was no “acceptable” style to copy. She had the phenomenal ability to make everyone rise to their greatest capability, whether they were winter visitors drawing posies, bored interior design kids forced to take basic art, or people like me… whatever I was then. A published illustrator and art director, but sometimes an utterly clueless no0B. Even more extraordinarily, she made every one of us appreciate the artistry everyone else brought to the classwork, no matter how skilled or unskilled the student. I took every class she taught, and then took several rounds of independent studies from her. She got me introduced to perspective (both architectural and atmospheric), color theory, how to SEE differently, how to THINK differently. She didn’t teach any advanced courses, but she filled in a lot of the things I should have learned sooner if not for my bullheaded attitude. We grew to be friends, going to lunch or to explore art openings. I finally got to see her art at a one-woman show at one of the community centers. In time, we each went our own ways, but I have never forgotten her or what she had to teach. Writing this post, thinking to link you to her work, I learned that Joan passed away at the end of 2012. I never realized she was that much older than me, because she felt like a contemporary. Her memory will stand eternally as one of the most influential people in my life and career, and I wish I could thank her. Joan nurtured my natural style as well as demanding that I stretch outside my comfort zone. I have abstracts, surrealist experiments, exercises in graphics and color that made my brain turn inside out. But knowing I wanted to paint book covers and be an illustrator, one year we agreed to have me paint “a book cover” for one of my independent study classes. I pulled out all the stops. I got friends to model for me, draping them in cloaks and tablecloths, with sword props and jewelry to catch the rhythm of line and shadow. I poured over books of artwork I admired. I dug through magazines looking for architecture references that evoked the visual story I wanted to tell. From the pictures, I created scads of sketches, laid out my perspective lines, all followed by tissue paper overlays, then more copies as I worked out the color scheme. (No Photoshop back in the day.) I bought fresh brushes and sanded the gesso’d board to a perfect tooth. And then I painted like my life depended on it. My name for the painting, focusing on the central figure’s pink cloak, came about because the cloak wasn’t supposed to be pink. The initial color studies had it in a kind of yellow-orange, part of the planned triadic color scheme (blue-green/red-violet/yellow-orange). And I’d look and look and look at the blocked-in color as I painted, thinking “That isn’t right. That isn’t right. That isn’t right.” But I couldn’t for the life of me figure it out. Joan taught me courage, to trust my instincts and to experiment. One day I simply daubed in the most ridiculous color I had — I could paint over it if I had to. Pink is sooooo NOT one of my colors-of-choice, generally. Pink turned out to be just right. I didn’t know why, it just was. A year or two later, Jennell Jaquays passed through town. Knowing her to be deeply schooled in art as I was not, I asked her why pink? Her answer? That I’d slipped away from my triadic intent to more of a simple red-green complement. My fuzzy grasp of how to execute what was in my head left bits that stick out and look odd now — the yellow path, for example. And I still handle color clumsily, despite Joan’s teachings. But overall, and despite the flaws I’ve learned to recognize, this painting remains one of my better large paintings, almost 30 years and hundreds of paintings later. Mike Stackpole, then working at Flying Buffalo, wanted to see it put to use. He wrote the solitaire adventure titled Elven Lords to go with the painting, and FBInc sold the book in a signed limited edition. After a time, I started to think of the painting by that name, which is the only one anyone else would recognize it as. Most of its life, the Elven Lords painting has hung on my wall, because it’s pretty special for many reasons. I’ve never considered selling it before now. Times have changed. The couple who modelled for the painting eventually divorced. The female figure, a writer friend who appears in a few other of my works and whose books I’ve done art for, has taken a different road from mine and we don’t see much of each other any more. I put up a different piece of art where this one used to hang, and was surprised to realize this one was not likely to go back up again. I’d like to see the painting live with someone who will appreciate it. 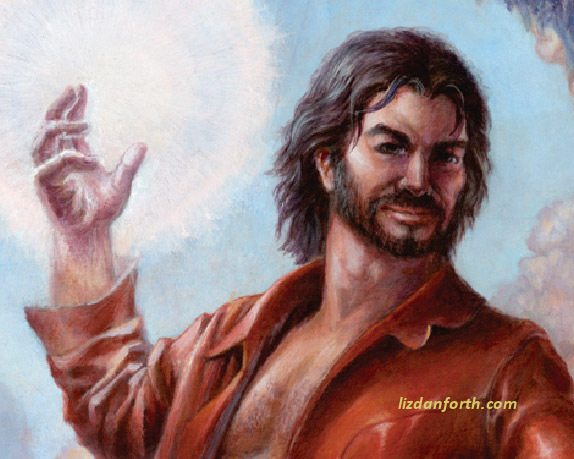 As with the cover art for T&T 7e mentioned in the companion blog post… this is your chance to own this painting. If you want to bid on this painting, send me a private email to etdanforth @ gmail.com and make your best offer. I will accept offers for at least two weeks (through Monday, May 12th, midnight MST) or until bidding stops. The painting is sold unframed, 24 x 30 inches (appx 61 x 76 cm), acrylic on masonite. There are NO publication or reproduction rights attached; all rights are reserved. (That is true for all the art on this website.) The piece was completed in 1986, while I was living in Scottsdale Arizona. I am asking for a minimum starting price of $1000. If you have questions or comments about Elven Lords (aka The Pink Cloak), feel free to ask those publically in the Comments here or privately. Again, my email address is etdanforth @ gmail.com (without the spaces). INTERESTED IN TWO SECONDS LATER? Click here to go to the other post, talking about the cover art for the T&T 7th edition. This entry was posted on Monday, April 28th, 2014 at 12:03 pm	and is filed under An Offer, Art, Creativity, Freelancing, History, Musings. You can follow any responses to this entry through the RSS 2.0 feed. Both comments and pings are currently closed. Fascinating to read your story, Liz. I knew your mother and dad, of course, but I didn’t know he took art classes. I remember him as a city planner, after the navy of course. He was very much a weekend artist, painting and sculpting with plasticine clay and ceramics. I have a lot of his watercolors from Hawaii. The whole family did these things, and I have to wonder if my mom’s comment was simply that his style changed … but not necessarily for worse, just different. Certainly my work has changed over time, and in reaction to things I’ve learned or been taught. I’m a sucker for sylvan scenes. What I really like about this painting is the mysterious forest pathway, leading to adventure. I’m glad you like the piece! 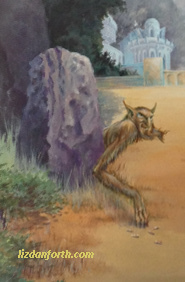 The forest creature looks just like I imagine the magician Shimrod’s pet looks like in Jack Vance’s Lyonesse. It was a furry thing of unknown species as I recall. And the piece overall fits the mood of that series. Usually your work (to me) is all about line and space, but in this one you showed a deft eye for color. The first (Suldrun’s Garden) is the best, and a truly magical novel. You’ll know after reading it whether you’d still enjoy the slight dip in quality in the latter two. Elven Lords has received a bit of $1000. Anyone else?